In the aftermath of The Panic 1792, Francis Flanagan was found hung in his home. There could be no doubt he’d committed suicide. Spring 1799. The New York State’s legislature adopted the measure of gradual abolition; every offspring of a slave born after 4th July 1799 was a free person but only after twenty-eight years of ‘apprenticeship’ for males, and twenty-five for female. Twenty-year-old Justice Flanagan returns to New York after four years’ away. Having qualified as an attorney-in-law, he’s come back for a mission and one mission only: to catch his father's murderer. In 1800 New York’s population is recorded at just over 66,000. Looking at what has become of the former New Amsterdam, the magnitude of the growth of the once-only a large town at the bank of the Hudson river is extremely remarkable. Much of the city’s expansion was largely due to its having been a refuge for fleeing slaves, the irony of the economy built on the bidding wars of human commodity c. Who couldn’t have missed Wall Street - The Devil’s Half Mile? Against the backdrop of a well-played plot, the modern-time equivalent of gang culture and collusions, Paddy Hirsch yarns upbeat narratives on the impacts of the first financial crisis in American History. He couldn’t have picked a better setting nor a time; the author of Man vs Markets: Economics Explained (Plain & Simple) is an old hand on Wall Street. In the gripping scenes that flow throughout the novel, the complexities of the abolition of slavery is depicted with ease; no sooner has the young lawyer protagonist disembarked the ship than he begins to ruffle some feathers –albeit the wrong ones and dwells further into the labyrinth of corruptions and betrayals of the people he thought would help. Nonetheless, never has he realised the ripple effects of his dropping a pebble or two in the uncharted waters. 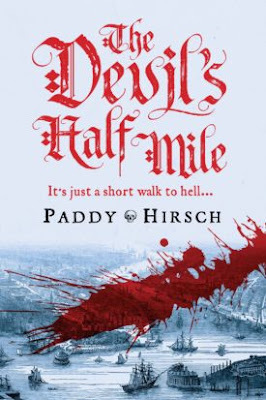 In the orphaned son of a stock trader, Hirsch creates a new breed of Irish identity. ‘I doubt any of them [Irish] would have named their son Justice. The Irish tended to name their children after the saints, and names like Justice, Hope and Charity smack of Protestantism…’ It’s a small wonder that his hero was born after Independence with a strong sense of identity about his heritage. During his time away from home, he took part in the bloody summer of 1798 at Kildare; an intriguing aspect whose relevance still rings true to this day. For had Justy lived three centuries later, he would’ve been branded a terrorist and lived in exile. What’s exciting about historical crime fiction is the stretch of imagination an author has to use in order to recreate circumstances with all the marks of similar struggles happening in today's society. Hirsch’s colourful interpretations of characters from eighteenth-century New York City, allow Justy to cross paths with famous names: The King Of The Alley William Duer, Isaac Whippo, Jacob Hays the New York Marshall and the former Secretary of Treasure, Alexander Hamilton. Furthermore, his take on the lives claimed and tangled because of the crash and the law are hard hitting. He’s careful with the bits of history he’s chosen to omit, although sometimes this requires filling in the gaps and further reading for readers. The variations of pace in the book are well balanced, whereby he manages to deploy subplots that do not steer away from the hunt of justice but they still catch the reader off guard. Following Justy’s viewpoint, the readers observe the revealing of hidden conspiracies - brutal and uncompromising. Hirsh ensures his combatant have flaws in many ways; his only uncle for a start is the fearsome The Bull, a don who controls the port and the water ways. Yet, the greater shame is endured in the discovery of his father's significant part in The Panic, and a pawn in William Duer’s Ponzi scheme. In spite of his trying to separate himself from his uncle, Justy's safety relies on The Bull’s mercy. Besides, his inexperienced moves contribute to his digging a deeper hole in the process and the net is closing on him in the hands of the ingenious Kerry O’Toole – an old friend supposedly. Would his mission be accomplished in time? In the anti-climax of the penultimate chapters, the shadow of slavery hangs like mildew clinging on one’s foot. Hirsh's focus on The Panic and his imaginary of Duer's Ponzi scheme and ‘the Brazil gold’ stocks are applaudable. Nevertheless, there seems to be hesitations to include the important details on the extent of slave trades that become the foundation of shaping Wall Street to its current status. Also, Alexander Hamilton is still a hero that saves the day, whereas his close relationship with Duer tends to be seen as unsavoury. Be that as it may, this debut crime fiction is one to watch. At any rate the novel is as entertaining as educating and tips the balance of what New York was and is in the face of Western History. No doubt that Hirsch’s warrior will grow much more in his subsequent cases pairing with his half Norwegian sidekick Lars Hokkanssen. 1446 slaves were recorded in the city in 1810 and 528 in the following decade. On 4th July 1827, all slaves in New York were freed. Thank you to Corvus for the review copy.